These blueberry cookies are absolutely delicious. 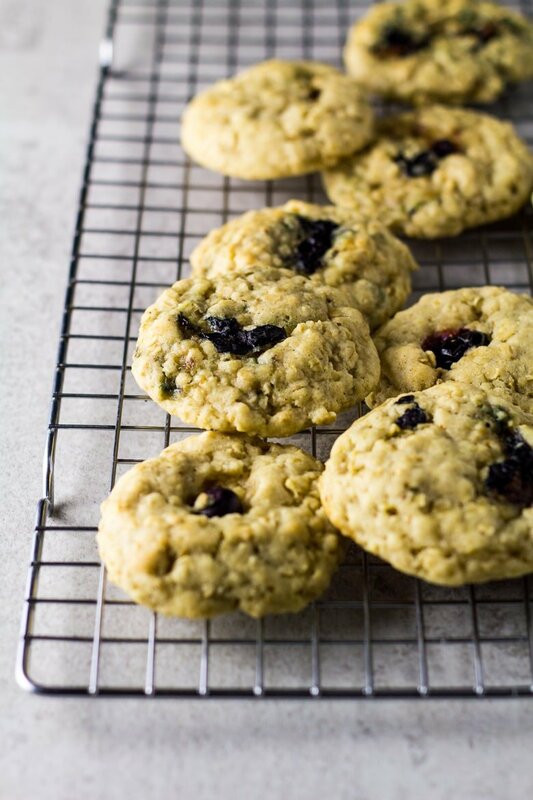 They’re super thick and chewy, soft-baked and perfectly spiced, and they are FULL of juicy fresh blueberries. These are great for a quick grab-and-go breakfast or snack! 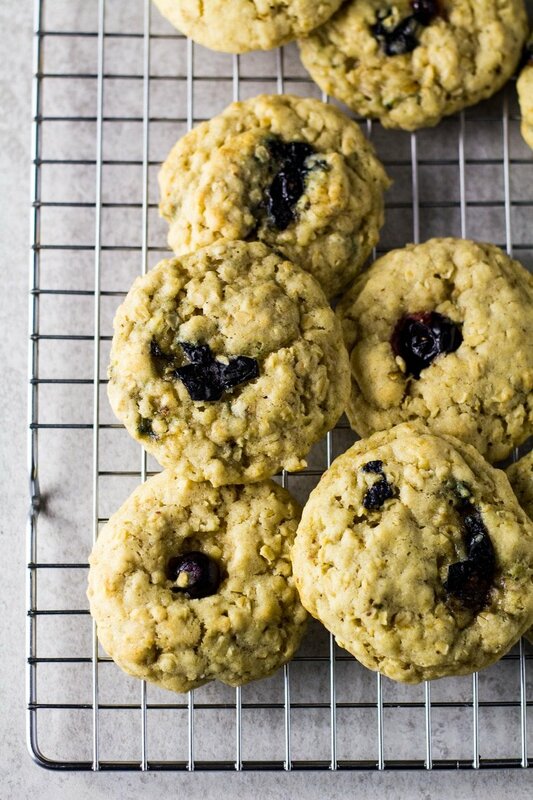 Looking for more delicious blueberry recipes? Check out my Baked Lemon Blueberry Doughnuts, Blueberry Breakfast Smoothie, and my Homemade Blueberry Pie. 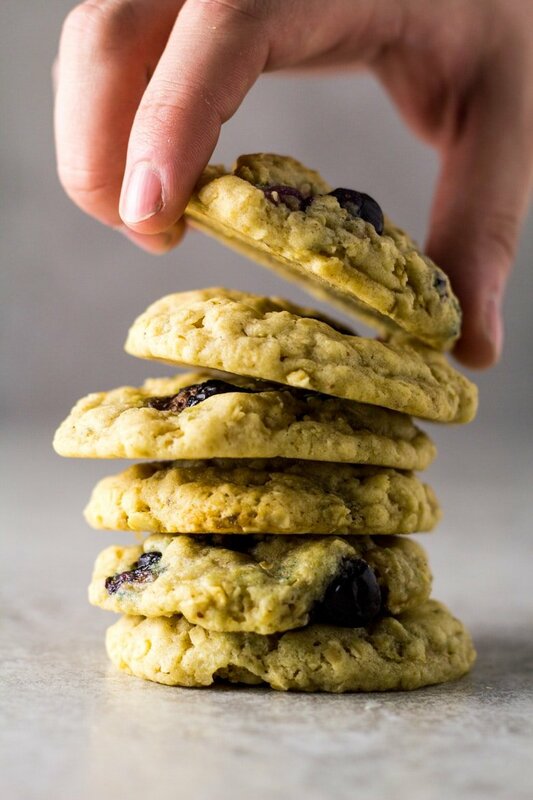 To make these cookies, simply start by whisking together the flour, oats, baking powder, baking soda, salt, and spices. Set aside. In a separate bowl, whisk together the melted butter and sugars until smooth and combined. Add the egg and vanilla, and mix until combined. Add the dry ingredients, mix until just combined, then gently fold in the blueberries. Don’t worry if some start to break up. Roll the dough into 1.5oz balls, and place onto a baking tray lined with parchment paper or a silicone mat. Bake for 10 – 12 minutes or until lightly golden around the edges. 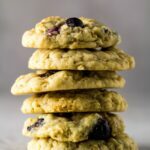 How long will these blueberry oatmeal cookies last? These cookies will stay fresh kept in an airtight container at room temperature for up to 1 week. For freshly-baked cookies every time, you can keep the cookie dough balls in the fridge for up to 5 days, or frozen for up to 3 months. Bake straight from frozen. 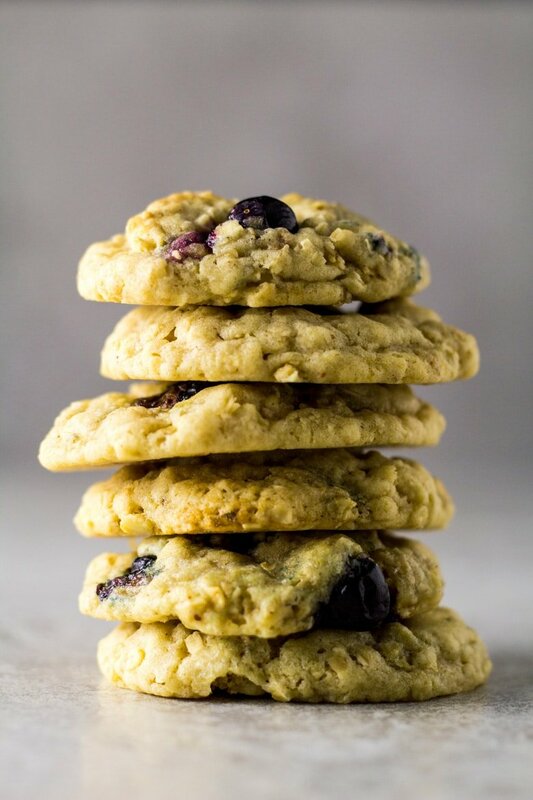 Deliciously thick, soft, and chewy cookies that are perfectly spiced and stuffed full of fresh blueberries! Whisk together the melted butter and sugars until combined. Add the egg and vanilla, and mix until combined. Add the dry ingredients, and mix until just combined. Gently fold in the blueberries. Roll the dough into 1.5oz balls, and place onto the prepared baking tray. Bake for 10 - 12 minutes. Cookie dough balls can be kept in the fridge for up to 5 days, or frozen for up to 3 months. Bake from frozen. Love these cookies. The blueberry was a delicious twist! I love this combination. These cookies were delicious and super easy to make!